HE'S BACK, a little older, a little wiser and more thankful than ever. Wade Ishibashi has every reason in the world to rest and recover from six trips from Hilo to Oahu in 2006. There's only so much chemotherapy a man can take, right? Last week, he made his seventh trip to Oahu within the past nine months. This time, there was no visit to Queen's Medical Center, though he has many friends there now. Instead, he patrolled the sidelines through four games in four days at the Merv Lopes Holiday Classic last week. A man with leukemia ought to sit a little more. Instead, he stands, minute after minute, sitting occasionally, in complete focus. He's not quite a yeller, but he's no docile mouse, either. After 25 years of coaching, he can smile. More importantly, he can breathe. 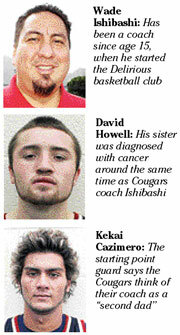 THERE IS SO MUCH basketball to be played for the Keaau Cougars. Jude Domizio, a 6-foot-5 senior, is the best shot blocker in the league. Point guard Kekai Cazimero is surrounded by quick, smart scorers. The hunger is there, especially since being second fiddle to defending Big Island champ Kamehameha-Hawaii -- or even third behind Konawaena -- is not something the Cougars enjoy. Their eight seniors play the game with attention to detail. They have a sense of urgency and a vault of patience to draw upon. Six of them have played together since they were eighth graders under Ishibashi in his age-group programs, then at the junior varsity level. They sometimes have the swagger that the Hilo Vikings carried when they won the state crown in 2000. There isn't a soul near or far who thinks Keaau will win the state championship unless you count the parents and fans of Cougar hoops. The swagger, though, is unmistakable. Ishibashi played at Waiakea, and during his teen years -- age 15, to be precise -- he began coaching youth in his Panaewa neighborhood. Since then, he has seen former players grow up and start families of their own. Ishibashi has enough experience and has formed relationships with coaches that normally belong to a man in his 50s or 60s. Ishibashi just turned 40. That's why, when he began feeling weak and tired during Keaau practices late last season, Ishibashi began to wonder. WALLACE ISHIBASHI, Wade's father, died in a drowning accident when Wade was 1. In time, his stepfather, Tony Delaries, filled the void. When Ishibashi's second dad passed away 15 years ago, he organized the Delirious basketball club. Delirious was Tony's nickname. At that point, Ishibashi had coached for a decade, and he was good at it. Winning was the first and only priority, for the most part. Then something happened again. It left Ishibashi reaching in the dark, searching for an answer. "I had a nephew that was close to me. I was out to win championships and tournaments. But he killed himself. I questioned myself on what kind of uncle I was, not being there to communicate. I told myself I was gonna become a different person and guide them through life," he said. "That's where my philosophies changed." So, Wade Ishibashi moved forward. As a coach, he still yells when it is necessary. He still challenges his players to reach their potential. It all means nothing, though, unless they reach their potential as men, husbands, fathers, sons. As friends. "To this day -- I take pride in this -- I think I'm one of the best when it comes to building character skills," he admitted. "I'm blessed with a lot of kolohe players, too, and they're all turning out to be awesome men." ONE NIGHT, late last season, Ishibashi found himself struggling as he tried to sleep. He couldn't seem to function. His lungs just wouldn't work. He was unable to breathe as he laid down, so he slept on a chair. Between that and the fatigue, he finally went to the doctor. A tumor the size of a fist was detected in his upper body. It was constricting his breathing passageway, and a corner of the tumor was putting pressure on the blood flow to his brain. In Waimea, a 60-mile drive from Hilo, he was ready to undergo a biopsy to learn more about the cancer in his body. "The anesthesiologist said if I were her husband, she wouldn't recommend it. Because of my airway blockage, if it collapses, I could go into cardiac arrest, and I could die on the table. My wife (Denise) stepped on the table, said a prayer and canceled it," he recalled. To complicate matters, he couldn't go to Oahu for a biopsy, either. "I couldn't fly because the lack of blood to my brain. They had to treat it with radiation, not knowing what kind of cancer it was. When I went to Queen's five days later, the tumor was totally gone, which was good, but they didn't know what kind of cancer it was," he said. After three weeks, the staff there learned that he had leukemia. The massive tumor was a fortunate fluke, perhaps. "That type of leukemia rarely causes tumors, so we look at it as a blessing," he said. Ishibashi spent 54 days in the hospital. "As much as they tell you, you really don't know 'til you go through it. I went through a total of six chemo treatments. From the first one, I hit the first wall. On Day 54, I told my wife I couldn't take no more," he said. Each treatment came with slightly different side effects. One time, internal bleeding that nearly took him. Another time, his temperature soared to 107. All the while, in the back of his mind and in the core of his heart, there was basketball. He knew he wanted to coach next season. All the work and time invested in his senior group couldn't go by the wayside. The long stays on Oahu were tough on his family. Denise stayed back after the first trip to handle family and business matters. His sons handle the situation differently. Wade Jr., 19, supported his dad, leaving the medical details to others. Haku, 15, struggled at first. He went into a shell and was withdrawn, but with time, Haku has grown. "His faith is starting to shine and show. When I was in ICU (in November), back home, my wife broke down and started crying, but Haku grew up overnight, that's how strong his faith was. He prayed and the things he said were amazing," Wade said. TWIN SISTERS Kristen and Kirsten, just 12, may be the most progressive members of the ohana. "The girls are the closest with me. They're sensitive and sweet and very prayerful with me. They just worry a lot," he said. The girls took themselves to task about their concerns. "They check out my blood work, they know about blood cells and platelets. They go on the Internet and learn a lot. Because of all of this, they definitely want to go into the nursing field," Ishibashi said. The sisters want to help cancer patients. "I said, 'You sure?' And they said, 'Yeah.' They say they're my primary nurses. Take my temperature. They do my blood work. 'Dad, your white cells are up.' They understand more about the prognosis than my sons." It was at tournaments across the Big Island and Honolulu over the past five years that many of the current Cougars found their confidence. Since Ishibashi's return -- he missed the first week of preseason with his most recent chemo treatment -- an already mature hoops team has begun to blossom. The Cougars lost to five-time state champion Iolani 51-46. They fell to No. 4 Kalaheo by just eight points. They're 7-4, not a fantastic win-loss record, but their potential and performance convinced Star-Bulletin Top 10 voters this week. Keaau landed in the poll at No. 10. For Ishibashi, that kind of news is sorely needed. "Any other time, I really wouldn't mind being under the radar. But in Keaau, there's a lot of negative things going on, so for the players and the school, it's a positive. Anything is a plus at this time," he said. NONE OF THE CURRENT Cougars were there when Austin Meyers died during practice in December of 2003. Ishibashi testified recently during the latest trial, which concluded in December with a ruling that the talented two-sport star had a pre-existing heart condition. The strain of that tragedy took a toll on so many people in Keaau, including Ishibashi. A broken heart drove him and his family to dig deeper, to lean closer to each other and further into their faith. David Howell, one of the key seniors on the squad, was one of the first to know what cancer would mean for his coach. Howell's sister, Cassandra, was diagnosed with the disease at around the same time as Ishibashi. "I've seen it first-hand, how weak you get in the hospital. It kinda prepared me. I knew how it was gonna be. Right now, he looks strong. At practice, if he's getting weak, he wouldn't let it show," Howell said. That's a big reason why the team prays more fervently than ever. They have circle talks, where they can talk about anything. "Whatever we talk about stays with the team," Cazimero said. "We're open. That's like a second family. That is our second family. He's like a second dad, and it made us try harder. It's great to have him back." Cazimero, with his wild bleached hair, doesn't quite look like the praying type, but he certainly is. "That's what makes us so strong, the closeness and the bond," he said. "We pray about all kinds of stuff. When he was in his last treatment, we prayed about that. Before we go on the plane, that kind of stuff." AS A WAIAKEA SENIOR in the 1983-84 season, Wade Ishibashi was the starting point guard. An injury to his pancreas, however, cut his season short. As the team played in the BIIF playoffs, he left the bench and was near the snack bar, a wall holding him up as he cried. That's where Denise, a Hilo High student who knew almost nothing about basketball, first saw him. The high school sweethearts have been through thick and thin since. This would be one of those not-so-thin times. Keaau has a real shot at the state tourney, maybe even a chance to win it all. "Going toe-to-toe with Kalaheo and Iolani showed that we can go as far as we want to," Howell said. "Everybody was head's up after those games. We weren't down. We know we can do this." Ishibashi calls himself a life coach. "I'm way better at that than I am a basketball coach," he insisted. "Being back on the court is, really, a blessing of time." Now, he gets up early, runs his landscaping business, and eagerly laces up the basketball shoes by mid-afternoon. The fatigue returns late in the day, but with each new morning, he's refreshed and energized. It's only fitting. The name of his company?